Students and faculty recently represented SFA's Department of Computer Science at the 2018 Grace Hopper Celebration, an annual event celebrating computer science pioneer Grace Hopper. Pictured from left are Fernanda Montoya, senior information technology major of Diboll; Elizabeth Hutchison, lecturer; Ariel Inman, junior computer information systems major of Lufkin; Jordan Barge, senior computer science major of Houston; Dr. Deborah Dunn, professor and chair; Sarah Bean, senior computer information system major of Houston; and Tenay Barker, senior computer science major of Austin. 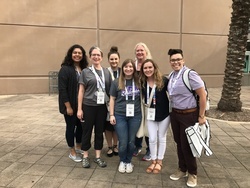 NACOGDOCHES, Texas - A group of students and faculty from Stephen F. Austin State University's Department of Computer Science recently attended the 2018 Grace Hopper Celebration in Houston, the world's largest annual gathering of women technologists. The event celebrates the late Grace Hopper, Navy rear admiral and pioneer in the field of computer science, and brings together women from across the country to discuss research, career interests and emerging technology and participate in professional development activities, said Dr. Deborah Dunn, professor and chair of the department. "It is critical and extremely beneficial for students to attend events like the Grace Hopper Celebration," Dunn said. "It not only gives them an opportunity to network with other women in the field, but it also allows them to attend sessions to learn more about the topics they find interesting." While at the event, several of the students interviewed with companies, and some even received offers for jobs and internships, Dunn said. Ariel Inman, junior computer information systems major of Lufkin, was able to speak to representatives from companies like Google, Microsoft and Apple about what they look for in employees. "That is an experience you can't find anywhere else," Inman said. "This opportunity enabled me to go outside of my comfort zone and better prepare myself for the workforce."